Morpheus Data was one of the companies that presented at Cloud Field Day 3 (http://techfieldday.com/event/cfd3/) in early April. I was fortunate enough to be selected as a delegate for the event that is put together by GestaltIT in which tech companies present to a group of IT professionals. The first presentation of the event was Morpheus Data which can be classified as a Cloud Management Platform (CMP) that handles things like instance lifecycle management that ties into tools like ServiceNow or Chef and Puppet. I was very intrigued given that my background is in automation and orchestration and I’ve seen a lot of the tools that are commonly used but had never heard of Morpheus Data. The value that a CMP or full fledged orchestration tool comes from understanding the distinct difference between automation and orchestration. Automation is a core component of delivering IT services that meet the agility that businesses expect nowadays. IT automation has been around in various forms such as shell scripts, Chef cookbooks or Ansible playbooks. Automating an individual task is fairly straightforward and easy to conceptualize. Let’s look at an example of this and how much complexity is added when we think about orchestration. The three tasks outlined above are fairly simple tasks that could be automated without much thought as they are self-contained. Now that we’ve taken a look at automation let’s look at orchestration. The two operations above highlight how orchestration involves the tying together of individual tasks to achieve a higher level goal. Orchestration is a concept often confused with automation but is typically far more complex to create and even understand. Orchestration is commonly needed when automating vm/instance creation, multi-machine application deployments, or things like rolling upgrades. Each of these requires a touch point outside of a just a single vm or instance. There are a number of other solutions for creating self-service orchestration. Some of the are Cloud Management Platforms (CMP) and others are CI servers like Jenkins. One of the challenges that many organizations now face is how to speed up the vm/instance provisioning process which typically requires multiple hand offs between teams. This is where Cloud Management Platforms (CMP) really shine by automating each of the distinct steps in the process and ultimately tying them together via orchestration. 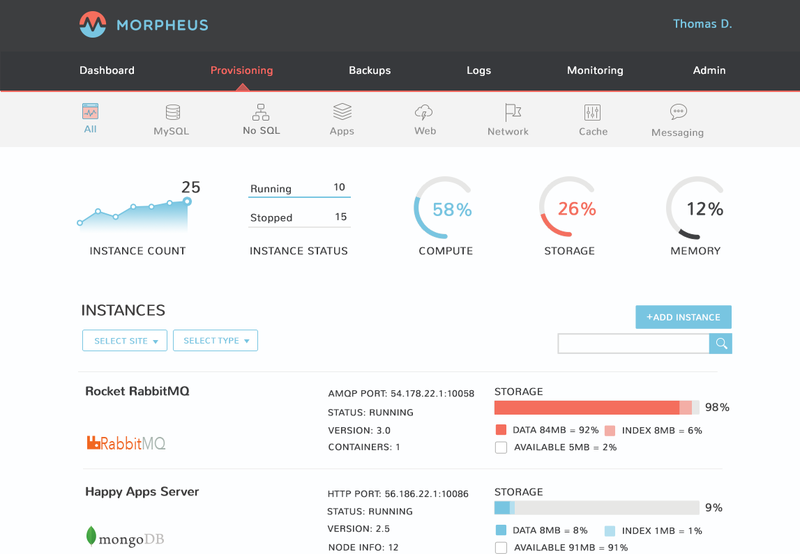 Morpheus Data is a Cloud Management Platform (CMP) that really shines when it comes to native support for automation and orchestration. Morpheus Data has a number of very interesting features that make it extremely robust as well simple to integrate into most environments. Native integration with third party tools such as ServiceNow, Jenkins, etc. The Morpheus Data solution contains a number of features that are common to other CMPs but looks to really have a DevOps focus that lends itself well to the current DevOps movement in which CI/CD pipelines are everywhere. The tighter coupling of the solution to tools like Jenkins or CI servers helps to reduce friction when it’s time for dev and ops teams to create coordinated CI/CD pipelines.